Roadside sign promotes Texas recovery attitude. Traveling through Refugio to Victoria after Hurricane Harvey I saw the devastation to homes, businesses and the lives of so many – it brought tears to my eyes. 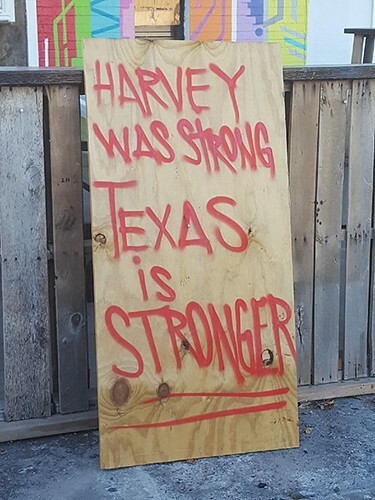 Then I saw a sign that summed up Texans’ resilience – “Harvey was strong, Texas is stronger.” I immediately turned around and took a picture. Diebel (left) discuss NRCS assistance options with NRCS District Conservationist Kevin Isom. And strong is what farmers and ranchers have to be in their daily lives faced with the challenges of working in agriculture, especially when dealing with Mother Nature. Rancher Stephen Diebel of Diebel Cattle Company, rode out Hurricane Harvey at his family’s century old ranch in Victoria. He was unsure what devastation the daylight hours would reveal after listening to howling winds and pounding rain throughout the night. He knew it was one of the worst hurricanes he had been through during his time on the ranch. When dawn finally broke, Diebel’s first sight was the twisted metal of outbuildings and barns, sheets of metal like crumpled pieces of paper laying scattered across his pastures. The pastures and roads were covered in water as far as he could see. A sense of relief washed over him after seeing the calves alive and well. He had feared they had been killed when the hay barn collapsed. The calves often sought shade and shelter there. “I was in disbelief that the weather could cause such a mess. It’s hard to comprehend the workload ahead of you,” said Diebel. A busy cow-calf operation with many items on the daily “to-do” list like calf weaning were put on the back burner as the more immediate needs were undertaken by Diebel, his family and ranch crew. Diebel said the hurricane put the operation behind 30 to 45 days on cattle weaning since they had to get power lines fixed and water wells going again. He was able to scout the ranch looking at other damages and found the windmills had taken their last spin during the storm. The bent blades made the systems inoperable. 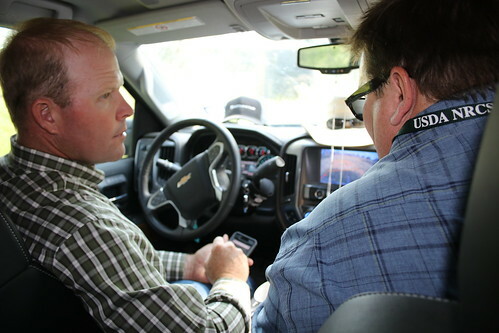 Diebel, whose family has worked with USDA’s Natural Resources Conservation Service (NRCS) on conservation efforts for several generations, realized one of his first calls needed to be to Kevin Isom, district conservationist with NRCS in Victoria. 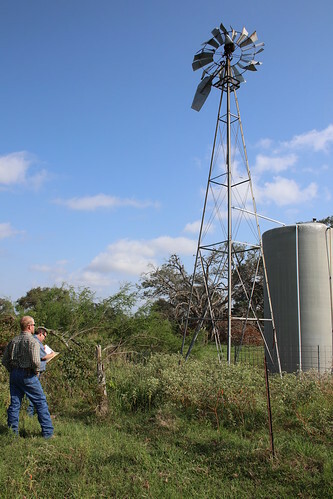 He knew NRCS would likely have assistance available to help replace the windmills with solar water pumps and panels to get the water flowing again. He filed an early exemption with NRCS so he was able to obtain bids and start the process of installing the solar pumps and solar panels. The early exemption does not guarantee funding for USDA programs, but it does allow the producer to install the practice before funding is awarded. Thankfully, flooding concerns were less severe on the Diebel ranch. He contributes this to the family’s conservation practices, particularly rotational grazing that keeps pastures covered in forage and builds healthy soil. The healthy soil was able to soak in the rain instead of ponding for days in the fields. As I watched the cattle enjoy the green grass that was abundant after the rain and listened to Diebel talk about how thankful he was that his family and friends were safe, I knew that even when faced with Mother’s Nature’s wrath, he like other Texans would rally together to rebuild and be stronger as a result of Hurricane Harvey. Learn more about disaster recovery assistance available through NRCS for agricultural producers and communities. If your farm, ranch, working forests or community sustained damage during hurricanes Harvey, Irma or Maria, contact your local USDA service center. Diebel surveys windmill damage with NRCS District Conservationist Kevin Isom.